In 1969, The Kildonan School was founded to meet the needs of students with dyslexia by strengthening language skills, by providing stimulating subject matter courses, and by building confidence and self-esteem. We have evolved over the decades to offer all our students state of the art technology and applications, an innovative college-preparatory curriculum, a diverse visual arts and design program, and a dyslexic-friendly foreign language program. 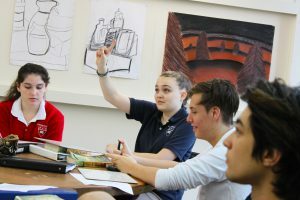 Our small school environment offers both individual attention and the opportunity for student leadership and student-driven exploration within a structured, yet flexible, program of study which progresses throughout the grade levels. Our curriculum follows our school mission to reveal and illuminate the strengths of the dyslexic individual. The Language Training tutorial forms the backbone of Kildonan’s academic program. Each student at Kildonan receives daily one-to-one language skills tutoring using the Orton-Gillingham approach. Orton-Gillingham offers a diagnostic and prescriptive approach to supporting the needs of dyslexic learners. Dyslexia is not merely difficulty with reading or writing. All language skills are involved to varying degrees: listening, speaking, oral reading, silent reading comprehension, vocabulary, spelling, and expository writing. The Orton-Gillingham approach supports language learning in two stages. First, skills are taught in isolation and tailored to meet the personal needs of each student in the daily tutoring session. Second, language skills are integrated into subject matter courses in a gradual, telescopic pattern leading to the ultimate goal of independent learning. Daily tutoring sessions at Kildonan are 45-minutes long. Material taught during the tutorial is reinforced during proctored study halls. To learn more, visit Daily 1:1 OG Tutoring. Elementary Literature is often closely connected to art as well as other areas of the curriculum such as science or social studies. During literature class, the class reads aloud both fiction and nonfiction selections, such as novels, stories, and poetry. Texts are selected that engage the students at their intellectual level and guide them to become more secure with more complex language and vocabulary. These books and stories lead to writing projects such as expanding a scene, comparing two characters, using the plot structure to create alternative stories, and writing autobiographies. By selecting a story or section of a novel, the class collaborates to create a play to perform for the wider school community and parents. Using the writing process in a supportive way in which the class brainstorms together, students compose dialogue for scenes or create alternative endings for plays. Elementary Social Studies: The elementary Social Studies curriculum follows the New York State Social Studies Learning Standards, the National Geography Standards, and the National Council for Social Studies Standards. Our Social Studies instruction and assessment incorporate our methods of inquiry, involve discussion and decision making, and provide opportunities for citizen involvement. Students are provided with the opportunity to learn about the social, geographic, economic, and historical characteristics of the world’s peoples and cultures, help students to understand and apply the concept of historic chronology, and explores how different world communities meet their basic needs and wants. Students explore communities throughout their towns, state, United States, and the world. Grade 6-8 Humanities focuses on what causes change. What elements of the past persist over time. How did our species evolve, change, thrive, and affect the evolution of other species. What makes a civilization? Students will learn about geography, how civilizations began, and what each civilization contributed to subsequent generations. They will explore primary source documents, investigate how the environment contributed to the civilization, and how people adapted to change over time. Students examine Greek Mythology through personal and creative expression. Students will explore the ways in which we discover and express ideas, feelings, nature, culture, beliefs and values. The course continues with an examination of the Ancient Greek and Roman civilizations starting with fairness and development. Students will explore rights and responsibilities; the relationship between communities; access to equal opportunities; peace and conflict resolution. Students examine the change from the fall of the Roman Republic to the Enlightenment (18th century AD). The course will introduce students to the vast sweep of civilization and the basic social, political, and economic movements. The fall of Rome, the Middle Ages, the Renaissance, the Reformation, the development and expansion of nation-states, and the revolutionary theories of the “Age of Reason” will be emphasized. Students focus upon developing critical reading and thinking skills, and increasing clear, effective expression through writing and discussion. This will be explored throughout the year through the overarching theme of “The Hero’s Journey.” Students will acquire objectives through consistent examination of ideas, themes, and characteristics of classic and contemporary cultures as manifested in the following novels: Old Man and the Sea, The Great Gatsby, and To Kill a Mockingbird. Grade 9 Individuals and Societies focuses on the foundation of contemporary global society. To achieve this, students explore the industrial revolution, World War I, the Roaring Twenties, The Great Depression, and World War II. Students focus primarily on the causes of global conflicts, as well as the resulting socio-economical issues, as well as exploring the social and cultural changes that occurred as a direct result of the radical political and technological changes during the time period. The key goals of this course are the love of reading and confidence in reading and writing. This class emphasizes clear paragraph structure, vivid expression, and the logical development of ideas. Creative writing is also developed. Students read short stories, novels and plays such as The Lottery, Brave New World, and The Crucible. Students also read poetry by Frost, Dickinson, and Whitman, and famous speeches such as I have a Dream, and The Gettysburg Address. They read informational texts to help them write argumentative, informational, and narrative essays. This class also believes in the value of interdisciplinary education; working with teachers of other disciplines such as Science, or History, students are exposed to a variety of topics such as the problem of climate warming where students, after thoroughly researching the topic, take a position on the issue and design brochures and advertising for an awareness raising campaign. Grade 10 Individuals and Societies focuses on developing an understanding of the many issues that create the modern world. Students explore the many innovations and changes that began in the 1950s, rippled through the 1960s, and continue to alter our world today. In addition, this course also places a heavy emphasis on the methods behind academic research, and how to communicate those findings in an academic manner. The Kodiaks are given a brief introduction to both American Sign Language (ASL) and Spanish. The ASL and Spanish teachers use a variety of teaching methodologies, materials, and technologies in order to meet young language learners where they are and help them develop vocabulary and language acquisition skills at their own pace. Students experience language in concrete and truly meaningful ways through activities such as performing commands, playing games, singing songs, producing skits, or dancing. Vocabulary is integrated in a natural and spontaneous way within the activities, projects and language games. The students are given a brief introduction to both American Sign Language (ASL) and Spanish. The ASL and Spanish teachers use a variety of teaching methodologies, materials, and technologies in order to meet young language learners where they are and help them develop vocabulary and language acquisition skills at their own pace. Students experience language in concrete and truly meaningful ways through activities such as performing commands, playing games, singing songs, producing skits, or dancing. Vocabulary is integrated in a natural and spontaneous way within the activities, projects and language games. Beginner Spanish courses are taught almost entirely in the target language. Students learn to be comfortable listening and speaking in Spanish. The goal for each student is to become proficient in speaking, writing, listening, and reading skills. Culture, art, and history are included in the lessons so that students acquire not only the practical skills of the language, but also a broader understanding of the Spanish/Hispanic culture and the usefulness of Spanish in a global society. Students are introduced to the complexities of nouns, numbers, gender agreement, and verb conjugation. They are able to describe people and things, talk about their school subjects, and locate Spanish-speaking countries on a map. Students develop their ability to express courtesies, count and express time; discuss daily life, activities, and hobbies; order food; identify objects in the home. Spanish Phase II continues with an emphasis on oral and written communication. Students at this intermediate phase acquire more regular and irregular verbs and use them to narrate in the present, near future, recent past, preterit, and simple future tenses. In order to help the student achieve fluency, direct and indirect object pronouns are introduced. More in-depth thematic vocabulary as it relates to travel, sports, clothing, personal hygiene, health, leisure activities, and finance is also introduced. In addition, students discuss the differences between American schools and those in foreign countries in which Spanish is spoken. In Spanish Phase III, all previous knowledge and skills acquired in earlier years of study are reviewed, as repetition and practice are necessary at this stage in second language acquisition. Making statements with “if” clauses, relative pronouns, the conditional tense, and distinguishing between the use of the imperfect versus the preterit or the present perfect tense are all structural items taught at this level. By doing translation exercises and compositions, students learn there are many ways to express ideas from one language to another. As with previous coursework, students are required to use verbal and written exchanges to solicit personal information, give and follow directions, and use command forms with a high degree of accuracy. The thematic vocabulary covered includes national lifestyles, national holidays, specific items related to national history, and Spanish colonies. This course provides an introduction to American Sign Language, the language used by Deaf people in the United States and most of Canada. Students will develop beginning level ASL communication skills, both receptive (listening) and expressive (speaking) with vocabulary and grammar in a cultural context. American Deaf culture and history will be introduced with an emphasis on making comparisons and connections to one’s own culture. This course is a continuation of the study of American Sign Language. Students will continue to develop ASL communication skills, both receptive (listening) and expressive (speaking), vocabulary, numerical proficiency, and grammatical structure. Students will explore American Deaf culture and history with an emphasis on making comparisons and connections to one’s own culture. To learn more, visit our Foreign Language Program. Mathematics at Kildonan focuses on integrating topics across concept areas to allow students to experience an array of math topics over the course of the school year. Students are grouped by ability, and classes are tailored to support the individual needs of students while differentiating to allow all students to reach their full potential. For elementary students, this course introduces young learners to the Numicon approach from Oxford Press. Numicon is a multi-sensory approach to teaching mathematics based on a proven pedagogy that raises achievement across all ability levels and sustains it over time. The concepts are divided into the following categories: numbers, patterning, calculating, geometry, measurement, and statistics. For students in grades 4-6, this course introduces students to an integrated approach to mathematics. Using the Oxford University Press, FM-1 is a multi-sensory, concept-based approach to teaching mathematics. The course begins with a unit in numbers, fractions, operations, and then introduces students to algebraic concepts, variables, and finally moves into geometry, statistics, data and graphing. For students in grades 7-8, this course continues to cover topics within the middle years and begins with a unit on ratios, proportions, and percents. This course dives deep into algebra and geometric transformations, studied by explorations of different transformations found in real life. The metric system is used to study measurement, and students learn to make conversions. This course introduces probability, with further work in statistics, data, graphing and calculating averages. For students in grades 8-10, this course continues to cover topics within the middle years and begins with a unit on expressions, equations, and formulae. Study includes like and unlike terms, applying equations to discover patterns and graph linear functions, geometric constructions, the metric system, and calculating area, volume, and surface area. Students are also introduced to rates of change, analyzing data, and graphing. For students in grades 8-9, this course begins with a study of more complex number relationships that gives students a deeper understanding of integers, roots, fractions, and decimals including scientific notation. Students spend the majority of their class time covering topics within algebra which allows them to develop and understand logical thinking as a way of deeper problem solving. Other areas of study include simultaneous equations, introduction to quadratics, geometric constructions, data analysis and statistics. For students in grades 8-10, this course begins with the study of geometry which includes angles, lines, polygons, circles, Pythagorean Theorem, and geometric transformations. The class covers statistics, analyzes a variety of graphs, and derives formulas from sets of data. Students also work with quadratics to prepare them for pre-calculus and more complex function applications. This course also reviews various combinations of algebraic terms and functions encountered in math classes to align the skill levels and discover specific areas that require additional review in or outside of class. For students in grades 9-12, this course reviews all the various types of functions encountered in higher level math classes to align the skill levels and discover specific areas that require additional review in or outside the class. Students demonstrate the ability to sketch and electronically display graphs and apply information correctly depending on the real world situation. Also covered is descriptive statistics and deriving formulas from random sets of data. Students calculate normal distribution, correlation, and perform Chi-squared tests on data. This course also prepares students for calculus. For students in grades 9-12, this course is a mix of pre-calculus and calculus. The topics covered are exponential functions and logarithmic functions; patterns, sequences, and series; limits and derivatives; integration; applied trigonometry; vectors; circular functions; and calculus with trigonometric functions. Students are expected to demonstrate ability to carry out their work on paper as well as use devices to display information electronically. They work collaboratively in groups but present their solutions individually in class. They will take a practice AP exam in the spring. Calculus 2 is a continuation of Calculus 1 which allows for deeper dives into the subject of derivatives and integration. Those deeper dives include the differentiation and integration of trigonometric terms. Students will develop a full understanding of those concepts in preparation for the AP exam. They will also work on conic sections and more advanced limitation problems. The Science curriculum seeks to give students in grades 2-8 a broad perspective in science by exploring various topics in integrated units. Grades 9-12 focus on one individual science per year (Biology, Physics, Chemistry). The elementary Science curriculum follows the regional state standards as well as the Next Generation Science Standards formulated by the National Research Council. We offer a constructivist approach to science for every student. Students experience the adventure of discovering science through inquiry and project-based activities. The addition of technology brings content to life. Students explore the structure and function of the world around them and gain foundational skills in experimental design, data collection, and measurement skills. Students explore a range of science topics to build knowledge and skills while learning to uncover identifying features that allow them to interpret the relationships organisms have with their environment. They explore technological innovations, chemistry, celestial bodies and movement, and gain experience in using the scientific method. Students explore how the human species interacts with the natural world by influencing and shaping it. They explore topics related to biology, human evolution, how organisms develop relationships with factors in their environment, reproductive patterns of organisms, and body functions. Students will use the scientific method, and also inquire into the biological and psychological consequences that occur when systems are altered. Students explore Earth and Space Sciences. They investigate Earth’s place in the universe by exploring evidence of the Big Bang and the expansion of the Universe. The class analyzes the relationship between celestial bodies as they move in accordance with physical law. Students analyze geoscience data to make the claim that one change to Earth’s surface can create feedbacks that cause change to other Earth systems. Students build models to illustrate abstract systems and to consider how variations to the system result in changes. They will also explore chemical and physical properties of water when experimenting with surface change processes, as well as reflect on Global Contexts in relation to natural resource availability and the sustainability of human populations and biodiversity. The Visual Art Program offers courses that involve both the conceptual and material aspects of art making. They introduce the practices of the artist and the creative process as well as promoting a willingness to surrender to the unanticipated possibilities of a work of art as it unfolds. Courses do not teach technique in a formulaic manner but, rather, emphasize ways of seeing and conceptualizing the processes entailed in making art. The aim of the program is to explore ways of seeing, thinking, and problem solving that are relevant to a variety of intellectual undertakings within the artist’s studio and beyond. The elementary art program is designed to connect to other subjects such as science or literature and also to stand alone to explore and develop skills and experience with materials. Students will explore color mixing using watercolors, drawing skills, and two dimensional design with collage and by painting ceramic tiles. They will use a variety of materials ranging from charcoal and pastels, acrylics, fabric, wire, bamboo and paper mache. Students will also focus on creating materials for plays and puppet performances. This class is an introductory study of the formal elements of art—line, value, texture, shape, form, space, color, and composition—as they relate to within the two-dimensional plane and art forms. Class work includes discussion, demonstration, studio work, and critique. This class explores the visual elements: line, shape, space, color, texture, time, and motion with the organization of these elements on both a two-dimensional and three-dimensional plane. It deals with the development of perceptual awareness, technical skills, and innovative solutions to problems related to composition and color. Students may also include some use of a photography laboratory or digital media. The intent of our interdisciplinary program is to enable art students to explore every conceivable form of visual expression including drawing, painting, sculpture, and photography. This class explores drawing through the development of both technical skills and concepts, as drawing constitutes the fundamental basis of all visual language. Dialogues will revolve around contemporary visual issues. Work will involve the use of all media with experimentation and invention stressed. Drawing will be viewed as a primary vehicle through which an artist grows in the struggle for freedom of expression. This is a class in visual understanding of creative thinking in drawing, photography, sculpture and collage with an emphasis on developing a greater depth of awareness of art and application of the Elements of Art and Principles of Design to their work in a variety of media. Studio experiences include still life, drawing, digital photography, wire sculpture, and mixed media projects. Each student will demonstrate progress over time by developing a body of work and organizing a portfolio. This course will establish a common visual language as students develop an understanding of creating and evaluating two-dimensional images. Through their work in a studio setting, they will experience the importance of the conceptual, visual, and relational elements of both known works of art and their own pieces. This class emphasizes perceptual drawing from life. Students will work with a range of media in order to investigate the elements of an art form as well as to solve problems posed to the group. As they develop their personal aesthetic, students will practice bravery, perseverance, and self-awareness. Each student will be supported in the discovery of his/her visual strengths and artistic voice. The design portion of this course will establish a common visual language as students begin to build an understanding of evaluating and creating three-dimensional objects. Students will experience and discuss the importance of the conceptual, visual, relational, and constructional elements of known works of three-dimensional art and the works they create themselves. They will be introduced to the elements of three-dimensional form through a sequence of specific problems. The installation portion of this course will be thematic in nature and draw inspiration from areas of study within the academic community. Students will be involved in working on ongoing three-dimensional constructions that are site-specific within the Kildonan campus. Students will engage in a collaborative process that includes planning, the acquisition and organizing of materials, and construction. The various materials used in this course will be appropriate to the problems being solved and may involve plastic, wood, paper, plaster, clay, metal, and recycled matter. This course will take two directions. First, the exploration and development of an individual photographic language using latent image production. Developing and printing are taught as integral to the formation of a personal visual esthetic. Digital photography will also be introduced in this course. Scanning and digital capture systems will be used. Digital color prints will be produced using Photoshop and inkjet printing. Students will also be exploring the documentary value of color information and the ability of computer photo programs to idealize our experience of reality. Photographs contain symbols and form that convey content, and this course engages students to carefully consider these constructs. The goal is for students to learn how to analyze photographs, develop opinions, and voice these ideas both visually and verbally. These concepts will be explored by examining iconic images from the history of photography and the student’s work. The course objectives will be achieved through discussions, studio photography, journal writings and photographic assignments. This course is designed to advise advanced students who are planning to pursue art after leaving Kildonan. Students are assisted in the process of identifying and applying to post-secondary programs that would best suit their interests. Along with art department faculty, students are guided as they build well-rounded portfolios in preparation for applying to college-level art programs. Group critiques are held as well as individual assessments as their portfolios grow. The music curriculum is designed to expose the student to a vast array of musical genres, history, theory, cultures, instruments, and sounds. Students are encouraged to explore personal interests and look for ways to cultivate their own musical expression. Primary music introduces a wide variety of music to the students in an effort to open up each student’s mind to the many styles of music that exist throughout the world. Students learn basic rhythms and/or strumming techniques as a way to prepare them to play songs. In class, students incorporate recording technology and use a wide variety of multimedia devices to create music. Students are offered an introduction to a variety of musical genres including classical, blues, jazz, country, and rock. They explore various forms of musical expression and develop an understanding of the identifying features of a particular style. As students explore the roots of contemporary music, they learn about performers, innovators, and the society that helped shape and form them. Students are introduced to music in notated form and develop the ability to identify notes, while developing subject related vocabulary and an understanding of the artform. They also have the opportunity to explore and practice an instrument of their choice and develop their skills. Students continue to develop their ability to identify patterns in music. They analyze a variety of songs, how they are structured, and how to appropriately label the different sections. They study how the concept of time functions in music by exploring rhythm, note values, meter, and tempo. The performance component of the class allows time for skill development on an instrument and offers the opportunity to participate in performances on campus. Students are encouraged to explore both leadership roles and supportive roles during collaborative rehearsals. This class introduces students to early music and the sounds of medieval times. Students gain an understanding of secular and sacred music, the origins of music notation and how melody and harmony developed during this time period. They practice their music notational skills by composing short segments of music, combining a set number of notes and creating a musical phrase. The performance element of the course offers the opportunity to devote time to skill development on an instrument of their choice, and to rehearse and perform at a school event. This class takes the student on an in-depth journey through the history of blues, jazz, and related American styles. By listening, students compare prolific performers of the genre and gain an understanding of a wide variety of musical expression. They discover some of the identifying elements of the different styles such as rhythmic feel and harmonic/melodic content. Part of the course involves skill development on an instrument, where students learn to play the basic 12 bar blues form and related patterns. As they collaborate with each other on a performance project, students work on developing their own musical expression. Sound Design teaches students how to record, edit, and manipulate sound on the computer and in the analogue environment. Students will learn recording basics as well as EQ, plug-ins, looping, pitch shifting, MIDI tracks, click tracks, and mixing. Students work with music as well as sound effects. In addition to teaching the fundamentals and advanced techniques of working with recording software, students learn about designing sound with hardware synthesizers, and other musical instruments. Each student is continually challenged to create an audio recording of their own or to do a remix of another artist’s work using the knowledge that they attain in class. They also create sound effects and music for school plays and other campus projects. Individualized Music Instruction teaches students to develop musical skills, think with an open mind, take musical risks, and prove themselves knowledgeable and technically proficient on their chosen instrument. Our one-on-one approach gives individual students a better understanding of how making music is a significant and meaningful aspect of human expression. Students grow musically at a rate that is both challenging and rewarding. 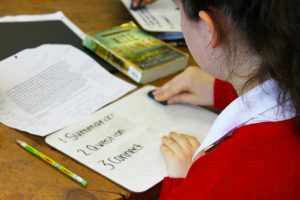 Students are assessed on self-motivation, collaborative skills while working in ensembles, and personal improvement throughout the term. Kildonan is committed to fostering positive self-esteem in all students. Our athletic program supports students in developing a positive, healthy, lifelong commitment to physical fitness and recreational activity. We provide a healthy, structured environment for the development of interscholastic athletic competition, and also a wide range of intramural activities designed to promote physical fitness. Visit our Athletics Options to see all the sports and activities we offer our students. Our Ski/Snowboard Program is a central element of our winter term. Students go skiing/snowboarding at Butternut Ski Resort in Great Barrington, MA every Thursday for 8-weeks. Instruction is part of the program for beginners through experienced skiers/snowboarders, and students have the opportunity to participate in the student Snowsports Patrol to enforce ski rules and assist with instruction of their peers. Our Equestrian Program is offered during the fall and spring terms. During the winter term, students may elect to participate in daily horse care and farm management. Our emphasis is not on the counting of hours devoted to service, but on the quality of the service they give to others. To learn more, visit Community Service. The tutoring sessions for students in grades 11 and 12 are supportive of the college planning process including college research, essay writing, and preparation for standardized tests. Climate change, racial and gender inequality, and mounting student debt are major problems that we face today as Americans. Throughout this course, students ask both how literature can inform our perspectives of social problems and how young people can leverage art and 21st century skills to design solutions. Students learn together in a community incorporating democratic principles. They will determine the social problems and the literature of focus, discuss works through Socratic seminars, and occasionally research, design, and execute solutions to social issues using a team-based approach. They will consider causality, social media, art as social dialogue, and nonprofit solutions. They study elements of literature and analytic writing such as narrative, literary devices, style, critical lenses, close reading, rhetorical strategies, and analytical papers. Students will often present their learning in written form, and they will synthesize their findings in a written summative assessment: a research paper of differentiated length analyzing a work of literature using literary and sociological lenses. In this course, students ask how literature can inform our perspectives of censorship and “intellectual” freedom. They will attempt to define the American community that we occupy with our fictional characters. Students will learn together in a community incorporating democratic principles; they will help determine the literature of focus as well as discuss works through Socratic seminars. Students will study elements of literature and analytical writing such as narrative, literary devices, style, close reading, rhetorical strategies, and analytical papers. Students will often present their learning in written form, and they will synthesize their findings in a written summative assessment: a research paper of differentiated length analyzing a work of literature read in-class or independently. Jackson Pollack, an abstract expressionist, defines an artist as “the one who is building things…some with a brush — some with a shovel — some choose a pen.” This class unites the brush and the pen, approaching writing and artistic production as equivalent creative processes. Students will hone their writing skills through activities such as author imitations, inquiry papers, and peer review. They will study elements of literature and writing such as thesis statements, diction, grammar, style and voice (academic and creative), argumentation, research, and citations. Students can also expect to take their written work off the page by transforming it into 2D and 3D art pieces (and vice-versa). They will explore elements of art such as proportion and plasticity, and they will learn within a flexible studio environment incorporating both solo work and collaboration. This course surveys the fundamentals of government and economics in the United States. It analyzes the American system in the context of its international counterparts, explores various disciplines of humanities (i.e. political philosophy, geography, and culture), and connects issues and events from the late 20th century to the present. Per Kildonan’s vision and mission statement, students will activate their background knowledge using a multi-sensory approach; such a process will allow them to establish their own understanding through exploration and reflection. The class will also develop their critical thinking skills and analytical viewpoints through readings, narrative exposition, collaborative activities, multimedia presentations, projects, discussions, and debates. This course emphasizes the decision-making process of American democracy and explores some of our major social issues. Topics examined in depth include national, state, and local government, our political party system, and responsibilities of citizenship. Students will explore six primary topics in political science: the fundamental concepts of government expressed in the United States Constitution; political beliefs and behaviors; political parties, interest groups, and the mass media; institutions of national government, including the Presidency, Congress, federal courts and the federal bureaucracy; public policy; and civil rights and civil liberties. Analytical skills and writing skills will be emphasized frequently. This course will introduce students to the study of theory of knowledge. It begins by asking how humans think and how our thinking has changed since the Pre-Socratics. It will also expose students to the ideas of some of the most influential people of all time, including but not limited to Socrates, Plato, Aristotle, Thomas Hobbes, Rene Descartes, John Locke, Immanuel Kant, and Friedrich Nietzsche. Students will explore many different questions posed by the greatest thinkers of our time, concepts of religion, the mind-body problem, ethics, morality, consciousness, and meaning. The aim of this class is to promote an academic inquiry into the basic ideas of “living the examined life,” to analyze concepts and ideas critically, to form original opinions on a variety of topics, and to justify claims with supporting arguments. This course reviews all the various types of functions encountered in higher level math classes to align the skill levels and discover specific areas that require additional review in or outside of class. Students demonstrate the ability to sketch and electronically display graphs and apply information correctly depending on the real world situation. The class also covers descriptive statistics and derives formulas from random sets of data. They learn how to calculate normal distribution, correlation, and perform Chi-squared tests on that data as well. The students prepare for calculus by learning about derivatives and limits. Students learn the concepts and applications while comparing calculations with graphical representation. This course is a mix of pre-calculus and calculus. The topics covered are exponential functions and logarithmic functions; patterns, sequences, and series; limits and derivatives; integration; applied trigonometry; vectors; circular functions; and calculus with trigonometric functions. Students are expected to demonstrate the ability to carry out their work on paper as well as use devices to display information electronically. They work collaboratively in groups, but present their solutions individually in class. They will take a practice AP exam in the spring. Calculus 2 is a continuation of Calculus 1 which allows for deeper dives into the subjects of derivatives and integration. Those deeper dives include the differentiation and integration of trigonometric terms. Students will develop a full understanding of those concepts in preparation for the AP exam. They will also work on conic sections and more advanced limitation problems. This year long course is strongly recommended for students who intend to pursue a career or college in science or math. Students will question the physical world by studying topics such as the physical and chemical properties of matter, atomic structure and nuclear reactions, the structure and meaning of the periodic table, chemical bonding and stoichiometry, the states of matter, kinetic and molecular theory, thermochemistry, solutions, reactions, chemical equilibrium, acids, bases, and oxidation-reduction reactions. This year long course is strongly recommended for students who intend to pursue a career or college in science or math. Students will question the physical world by studying its details. In this course, students will learn about complex processes through application and respectively, how to write laboratory reports. They will also examine topics such as forces, motion, momentum, impulse, impact, energy transformations and conservation, motion in two dimensions (i.e., circular and projectile motion), sound and waves, light, the electromagnetic spectrum, reflection and refraction, electricity and magnetism, and relativity. The science of sustainability is an emerging field of science, providing a multi-disciplinary approach to understanding the interactions between natural and social systems, and how these interactions affect sustainability, which aims to meet the needs of present and future generations while effectively addressing significant global challenges, such as poverty and climate change. Students generate projects to explain real-world problems, apply scientific knowledge to detail and evaluate data, offer scientifically supported judgments, and design and implement scientific investigations possessing a hypothesis, variables, data collection, and conclusions supported by scientific reasoning. Students begin the course focusing on theater history, with students traveling all over the world virtually. Like theater itself, study begins in Ancient Greece and its cultural contributions of amphitheaters, drama masks, and the Greek chorus’ interpretation of classical plays. Students also study Japan’s Kabuki dance-drama and Japanese performance including Noh drama, Kyogen comedies, and Bunraku puppet theater. Study ends in London with Shakespeare and the Globe Theater. Students then move to direct experience with performance including improvisation, skits, learning the importance of playwriting, which culminates in a student created short performance complete with costume design. This beginning robotics class will utilize the Lego Mindstorms EV3 platform. Its objective is to introduce students to basic programming, building, and problem-solving strategies. Students will acquire collaboration skills as part of a team. They will explore how to use the LabView programming platform as well as gears, timing, sensors, friction, and mechanical concepts. They will employ all of those tools to design robots for specific tasks and scenarios. * Meets outside the academic day. No two students’ journeys to college will be the same. Therefore, this class will offer an individualized approach for students to focus on those steps that are important to them. Open to both Juniors and Seniors, this class will begin each semester with a sit-down meeting to define objectives and deadlines based on an individual student’s needs. Objectives include but are not limited to college search and application, scholarships and grants, test prep, accommodations and assistive technology, resumes and career searches, research papers, note-taking for online courses, internships, and gap-years. Students will also target and develop their time management skills in order to adhere to deadlines and meet objectives. Edge is an approach to learning that combines self-driven inquiry and interdisciplinary study. Students enrolled in the program explore a topic or problem using the larger content areas of Literature, Science, and History as lenses. They conduct that inquiry according to a year long, personalized process of self-discovery, research, and project-building. Students spend three periods a day in Edge. They attend classroom-based math courses, tutoring sessions, and other curricular offerings (i.e. technology, assistive technology, art and music). Most of our Edge students meet their Literature, History and Science requirements through their work in Edge. Some, however, support their studies by enrolling in Core Content classes outside of the program. To learn more, visit Edge.